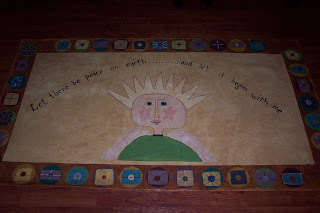 A couple of years ago I took a floor cloth class at a community center. It was so much fun even though there was no way to finish my design all in one day. Patience is your best friend when you are making a floor cloth! My angel design came from a free pattern in a rug hooking calendar although I did draw her freehand since she was relatively simple. The designs around the edges were done by using large circle, small circle, rectangle, and square cardboard templates. They also have a great tutorial on hemming right on their website. I’ve ordered from them and they have very nice quality canvas – I especially like the type that you don’t have to hem. If this is the first time you’ve made a floor cloth, you may want to try something smaller like a placemat. In any event, if you are using canvas that has not been primed, you’ll want to prime both the back (one coat) and front (two coats) with acrylic gesso. Gesso is a primer that almost looks like white glue and seals the canvas so that paint won’t be absorbed into it. Make sure that you let the gesso dry for 24 hours – although gesso does dry quickly and you will probably be able to do all 3 coats in one day. Now you’re ready to begin your design. When you are designing your floor cloth think from the bottom forward. First the background, then the design, then antiquing if that is part of your design. I’ll give you the steps I used for mine. All paints were acrylic and for any colors that overlapped, the bottom coat had to be dry. PS A tip for doing eyes that I learned as a dollmaker. If you want to be sure they are even, draw the one on the right side (as you are facing it) if you are right-handed, then turn your picture upside down and draw the one on the left side. What a great tutorial! I have always loved these painted floor cloths. Good job! There's another source for pre-primed, pre-hemmed floorcoths. Go to http://canvasworksfloorcloths.com/wordpress/make-your-own for all kinds of info, kits, videos, etc. Canvasworks' floorcloths are made from much heavier canvas than Fredrix. They lie very flat and have a beautifully sewn hem. Very permanent. What a darling design~ well done! I haven't done floor cloths in years, totally forgot about them. This is such a good tutorial, thanks for sharing. Really like your new blog header; very nice! Love the tutorial as well, floor cloths are wonderful and useful. Looks like you did a great job on your floor cloth. Tried my hand once doing this - we started with regular canvas and with the drying in between coats, days went by and I really had no good place to put it while waiting. My little rug was little and I guess it did not look awlful for a first timer, but now I am not even sure where it is - we have moved a couple of times since I made it. But, it was fun, and someday I would like to try again. I love the trim you painted around the edges; it really sets it off nicely. Hi Jill, Just stopping by to say Hi. Jill, some people accept awards and some do not. In case you do, I have a Happy Award for you on my blog. If not, that is perfectly okay - you do not need to contact me; this is just a way to let you know that I look forward to reading your posts. Great tutorial and the floorcloth turned out great.